I've organized gift ideas below by category/sport, and yes, there are some giveaways. Read to the bottom to enter the contests. All links go to the product or company website. A few links go to the Amazon website (If you choose to purchase anything off Amazon I might make a few pennies off the purchase, but please feel free to shop wherever works for your family. Finally, Altitude Sports has been a huge supporter of this blog so you'll find links to their website as well where you can order quality outdoor gear and clothing online across Canada. You can read all about my son's Prevelo Zulu Four here: What to Look for in your Child's Next Bike (and what to skip!) - note I have partnered with Prevelo Bikes this year as an Ambassador. And you can check out the complete line of Prevelo bikes here. One cool thing about Prevelo is that you get to choose between two different lines of bikes (the more affordable Alpha series, and the more technical Zulu series.) Have children that are not getting big air in the bike park and like casual pathway riding or easy mountain biking? Purchase one of the Alpha bikes and know that you're getting a quality bike without some of the fancier components your child might not need. AND all Prevelo bikes are now available (and in stock) for order from the Prevelo website. Bike Gloves (we love the ZippyRooz half finger ones.) And for cold weather biking, we're a fan of these Outdoor Research Gloves from MEC. A buff for cold weather riding and fat biking (we always wear buffs under our helmets to keep our ears warm when riding in cool temperatures.) Alternately, check out these Outdoor Research Ninjaclavas which look amazing. A new bike helmet, a bike bell as a stocking stuffer, mountain bike padding, or a bike jersey if you can find a youth sized one. And ENTER TO WIN a family day pass (for up to three children living in the same household) for B-Line Indoor Bike Park. All out Kids Gear has a great assortment of backpacks from kids' starter packs up to hydration packs and overnight packs for backpacking. My son uses a small hydration pack for our day hikes but has a Deuter Fox 30 for overnight trips. We love this backpack and are pleased with the amount our son can carry with it. Get the kids some snowshoes and enjoy year round hiking! A new snowsuit or ski pants/jacket combo (We are in love with the one-piece mono suits from TOBE outerwear - read my review for the TOBE Novus Mono Suit here.) - and yes, they are worth the price. And, ENTER TO WIN a youth Icebreaker base layer set of your choice and a set of youth Icebreaker ski socks from Altitude Sports. Check out the selection of youth Icebreaker products from Altitude Sports here. Dress the kids warm and get out to play! Climbing helmets are great for scrambling and hiking too! This is the obvious choice, right? Seriously though, a pair of skis makes for a great Christmas gift if your family wants to get into cross-country skiing. Buy the skis, boots, and poles, and then you're set with free skiing the rest of the winter. And if you're buying downhill skis, consider Roces adjustable ski boots that expand to fit your child for several years. And need to save a few pennies? Check out the local consignment stores. Your child likely won't care if their skis or boots aren't brand new. I bought my son's cross-country boots second hand from Trail Blazers in Cochrane this year. And ENTER TO WIN a $50 Gift Card from Trail Blazers. A fishing rod! (Something my son just discovered he enjoyed this summer while backpacking) - My son has the Junior Ugly Stik rod and we've been satisfied with it. A Strider Ski Attachment for balance bikes (has to be Strider brand) - my son loved his! We've had fun with a Stiga Kick Scooter with ski attachment as well. And if your child needs more balance, check out these Tri Scooters with skis. Alternately, if your child would rather sit than stand while sliding down a hill, check out these new Stiga Snow Riders. Finally, you can buy your child a regular scooter as a Christmas present as well. Our city pathways are oven shoveled year round meaning scooters can be used throughout the winter on warm days. Snow toys (including snowball slingshots!) - See a giant assortment of fun toys here from Airhead Sports. A step counter to encourage walking and daily active living. My son has the Garmin Vivofit Jr. Activity Tracker. So far our only complaints are that the battery needs replacing frequently and we've gone through several straps. Otherwise, we've enjoyed it a lot. Another idea for an activity tracker, that can be charged without replacing batteries, is the Fitbit Ace which we're consider for our son's next tracker. And I imagine you can find them at any electronics store. Active toys for indoor or outdoor play. I personally love the ninja toys (rope ladders, zip lines, and slacklines) from the Slackers company. A One World Futbol, an unpoppable soccer ball that never needs a pump and never goes flat. Perfect for travel, vacations, camping, or just the backyard. And, when you buy one of these balls, the company donates a portion of the price to organizations helping to bring play to youth in disadvantaged communities. Fitivities, the board game that moves you - "Each individual or team competes against each other by completing the number of repetitions of a given exercise, which are determined by the spin of the arrow." "Fitivities is part board game, part workout, and all fun." And check out these ideas for active toys from the Active for Life Gift Guide. The Gift of Experience and Fun - Gift cards, ski discount cards, and more! Want something that's less about collecting "stuff" and more about family bonding and fun adventure? Calgary Climbing Centre - Take the kids to one of the Calgary Climbing Centre's Climb Parks for an hour of fun on creatively-themed climbing walls. There are two locations in the city and no experience is necessary thanks to the auto belay system that's used on every wall in these parks. Learn to climb and have fun doing it! Put a ski discount card in your child or teenager's stocking. All giveaways finish on November 26th at 12am. A winner will be chosen randomly for each draw on the 26th. Each winner has until November 28th to respond to the email I will send out. If you do not respond, a new winner will be chosen. All contests are open to Canadian Residents 18 years of age or older. Please note that you will need to be in Calgary this winter in order to use the gift cards for B-Line Indoor Bike Park or the Calgary Climbing Centre. You will also need to visit Trail Blazers in Cochrane in person in order to use your $50 gift card. Shopping for All Out Kids Gear and Altitude Sports can be done online from anywhere in Canada. Big Thanks to all sponsors of this year's holiday gift guide! Amazing ideas Tanya. Thanks for always giving us reasons to get the kids outside!!! No excuses! Favorite hiking trail - why just one? Any trail that's not too crowded, has a variety of terrain and a destination sounds great to us. Fav. family winter activity - downhill skiing. Kids have tried rock climbing outside and at a climb park - one definitely likes it, one kid thinks it's too much work though they both thought the climb park was fun. Such a great gift Guide as always Tanya! Tried rock climbing - yes, both kids, they loved it and were great at it! Kids love biking at COP! My boys love the climbing centres - looking to sign up for classes! I got my kids (4 & 6 yo) into a couple of climbing classes at the MRU, but we've yet to hit a climbing park since. Thanks for the reviews and contests! Thanks for all the great ideas! Still need a couple pairs of winter boots at our house. Our kids have tried climbing but I’m sure they’d love some lessons. Fave hiking trail with the kids so far is troll falls! Perfect distance, terrain, areas to play in and of course the waterfall ! Our kiddos have never tried climbing and I’m sure would love to over the winter! My family's favourite winter activity outside is cross country skiing. Our favourite hike is Ptarmigan Cirque! Our favourite hiking trail is troll falls. Our favourite winter activity to do as a family is downhill skiing. We like to bike at b-line and chestermere family bike park! We love sledding in the winter! We like biking on highway 66 in the spring. We have never been rock climbing but something we would love to do. We still need toques and wool socks. My youngest needs xc skis! Never been to the climb park before. I’m sure my kids would love it. We like rock climbing, especially outdoors. We haven't been to the climb parks yet. What a fantastic list! I tend to think of things throughout the year and then totally forget when it comes time to pick up gifts. Favourite family hike - Last year we did Jumpingpound Summit and really enjoyed it. Favourite winter activity - Our youngest son discovered snowboarding last year, so this year I'm taking lessons too so we can enjoy it together. Have we tried climbing and what do we think - Yes! We've only done indoor climbing, but it's always been a good time. I'm looking forward to the day when my kids can belay for me! Have we visited a climb park before - We had our sons birthday party at the Hanger climb park a couple years ago, everyone loved it and a few friends have since had their party there too! We haven't biked much other than around our home. We still need base layers! We tried rock climbing when my daughter was younger and she was not a fan. Maybe she would enjoy it now she is a little older. Great giveaways to put under the tree! We have yet to visit a climb park in Calgary. Lots of great giveaways! We are bikers more than hikers and our current favourite trail would be the Valley of the Five in Jasper. We love to cross-country ski in the winter and both kids could could really use some good wool base layers. We also need a new pair of cross-country skis for one child. I really wish we lived closer to Calgary as the bike park and climbing gym passes would be awesome too! 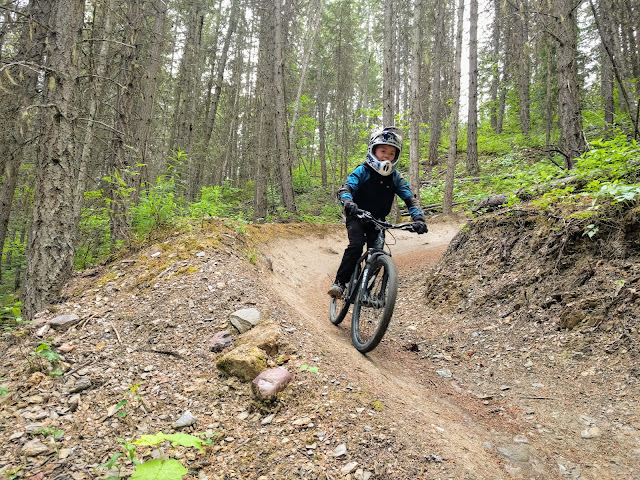 All Out Kids Gear Giveaway + Our favorite trail is at Exshaw, Alberta. It is at the far north east corner of the town. Although most trails out of town lead up the hill and seem to connect. We love the Tiger Lily Loop at Glenbow Ranch Provincial Park for a short, nearby outing! My kids are really starting to enjoy cross country skiing this winter, and I'm thinking we may need to get them their own gear! They like to climb - they do it at school - but we haven't tried a climb park yet! Our favourite is hiking the Chief in Squamish! Its mild here so we still like Geocaching! I second the trails at Glenbow Ranch for some easily hiking (especially with a toddler in the winter). We love to cross-country ski in the winter (excited for some snow closer to Calgary so we can get out soon). Our little guy is just getting ready for his first biking adventures (so far he's been confined to the Chariot but he's been going to get his strider bike out of the garage so I think he's almost ready for his own wheels). We're always looking for new mittens - something that is going to be warm and stay on! We haven't taken the family to a climb park yet (and the little guy hasn't tried climbing yet - but I think he's going to like it) but this winter might be the perfect time to go. Our favorite outdoor winter activity would be cross country skiing.. Growing up in a Norwegian family, it is just something you do.. it is in our blood. My son loves rock climbing and actually just invested in his first harness! Troll Falls was fun this summer ! need another set of baselayers! our fave hike is Bruce Trail. Our favourite winter activity...I guess it'd be skiing (downhill and xcountry), although we're hoping to get fat bikes this winter, and I can see that quickly becoming our favourite! Our favorite hiking trail is in Pinery conservation area. Our favourite family activity is to ski. We love cross country skiing as a family. We live in the Northwest Territories and it only takes 5 Mins of walk with our skiis and chariot to toll our toddler to the skidoo and dog running trail where we can ski. It's great fun and exercise for us!! One of our favourite hiking trail is the Heather trail in EC Manning Park in BC. We hike at Prince Albert National park on numerous trails. Our favourite winter activity is skiing. Our favourite family hiking trail is Pacific Spirit Regional Park. My kids love to go sledding in the winter. My kids have done the rock climbing wall at places like cobb's adventure park/corn maze but nothing bigger than that before. We have never visited an actual rock climbing park before but i think my boys would have a blast! Thanks for the chance. Our favorite hiking trail is on our property in No9rth eastern Ontario. Our favorite outdoor winter activity is ice skating. We build a rink in the backyard every year. We like going tobogganing and skating in the winter. We loved hiking up Mount Robson together - beautiful views! Enjoy many local trails closer to home as well. We like to build snow forts and snowmen in our yard! My favourite trail is around Kathleen Lake in the Yukon. Such Great views! Tried rock climbing - Yes, been lots and they love it! They prefer real rock to gyms but love gyms too. Been to a climbing park - Yes, such a fun time! Favourite hike - We enjoy troll falls. Favourite winter activity - skiing. Favourite bike trails - around our neighbourhood or fish creek park. Gear still needed - baselayers, kids keep outgrowing theirs. Tried rock climbing - we love rick climbing! Great gift guide! I'd petsonally like everything on the list!!! :) And I love the smiles in the fishing picture. all credit to you for the smiles in the fishing picture. And all credit to you that there's a photo of a fish on my blog!!! Been to several climb parks--good times! Love, love your Xmas guide! So many great outdoor related ideas for the whole family! Thanks for putting this together and for the opportunity at some fantastic giveaways! Tried rock climbing - yes for mama only. Been to a climbing park - yes, but my oldest didn’t take to it the first time so want to try again! So far, our favourite hiking trail with our 5 year old has been Ptarmigan Cirque. We could not pick a favourite outdoor activity in the winter - we love them all! Skiing, skating, sledding, trail walks - winter is awesome! For winter gear - our daughter needs cross country skis and boots. We have absolutely loved living calgary and have grown a deep love for the local Rocky Mountains. We love skiing hiking camping and entering into the hiking world. Our three little ones have learned with us creating an amazing family bond we are pumped to grow in. A favorite hiking trail is tough to choose! I think we love Troll falls for the quick reward. We really like Hector Lake and camping out there. My family tried rocking climbing at the rocky mountain ccc and really enjoyed it. Hopefully transition to outdoor at some point in the next few years. we also tried the climbpark and had a blast too! Tried rock climbing - yes, they loved it and want to go again! MY kids are still in need of a one winter jacket, mitts for skiing and larger buffs for their ever growing little selves. Love the mixture of ideas, will definitely be using the idea of an item with an activity this holiday. Thanks for sharing! Lake Louise Tea House is our favourite hiking trail. Our favourite outdoor activity in the winter is cross-country skiing. Chester Lake is our favorite hike. Might need to get new ski boots as my son's feet kept growing. Such an awesome read! We are still not a very outdoorsy family but the kids would be all over the biking and climbing activities. I entered those giveaways :) Thanks! We love cross country skiing in the winter. My son needs a new hockey stick as he has grown to tall for his. My kids have never tried but both want to try it. Our favourite hiking trail is Grotto Canyon in the winter, spike up, sled down! Our favourite winter activity is hiking up icy trails then sledding down! Our kids still need new ski gear for the year as they outgrew last year's! My kids have tried rock climbing and they LOVE it! Fave family hiking trail: the local ones in MA we can get to most often! Fave family winter activity: cross country skiing so far - hoping to get the little one into downhill this winter! My kids love biking around the neighbourhood. We’ve tried a couple local outdoor bike parks - they are tentative but starting to get braver! The kids love the climbing - my injuries don’t allow me to do it anymore! It was fun back in the day! The kids love sledding - they can do it for hours - and on their own! Win-win! We love the trails in K-country! Nearby and beautiful scenery! My son needs a larger size of snow pants this winter season. Grassi Lakes Trail is our family's favorite place to hike. It's gorgeous! Our favorite winter activity is sledding! So many laughs & a great workout, too!